The original Barbie was launched way back in the 50s, at the time, people didn’t think much of it’s cartoonish figure…and they certainly never though that people would eventually go to great lengths to mimic the look, nor did they think that culture might someday adopt the look as an ideal. Even the most conservative moms would buy there daughters Barbies over the past several decades, without even a thought of how it’s body image makes girls feel. It even seems that up until the last decade or so, the body image of Barbie didn’t really do much to affect culture. Times have certainly changed, however, since the late 90s. Annorexia is running rampant, more and more girls are using surgery to change their appearance, and there are constant debates over how highly sexualized portrayals of women in toys and media affect girls. Enter what pop culture has dubbed “Normal Barbie,” which has just arrived in time for the holiday season. 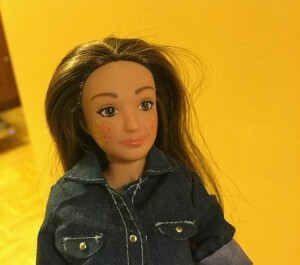 The doll — whose real name is “Lammily” — has the measurements of a typical 19-year-old woman’s body and comes with a sticker package of acne, cellulite, stretch marks and scars.